The art of crossing the road | Where to next? Poor John and I really appreciate everyone’s good wishes for our safe travels. I suspect you all worry that we’ll be robbed at gunpoint, taken hostage in some remote location, tossed into prison on some trumped-up charge, or mistaken for terrorists or criminals, as I was when I crossed in to Turkmenistan in 2011. Your concerns are misdirected. In all seriousness, the most likely disaster waiting-to-happen starts with our attempt to cross the road. Oh sure, all these countries have zebra crossings—those white stripes painted on the road to indicate is where you should cross. But in this part of the world, a zebra crossing is really a rough indication of where you could take your life in your hands should there be a slight pause in traffic. Every now and then motorist surprise us. Yesterday as we hovered at kerbside in Bukhara, one of Uzbekistan’s top tourist destinations, a car actually stopped at the zebra crossing. Shamed by this act of selflessness, fellow motorists across three lanes of traffic actually stopped at the crossing, allowing us to briskly walk across the road, rather than duck and weave through the maze of vehicles. But generally we wait for a gap in the flow of traffic. Then we proceed slowly with a hand extended towards oncoming vehicles. We figure that motorists don’t really want to hit us, but they don’t want to stop either. We try to make it easy for them to see our intentions, so they can slow down a bit and swerve around us. So hone your skills on assessing speed and distance, and learn to proceed slowly with your eyes locked on the traffic. And if all else fails, you can do what we had to do once in Indonesia—hire a rickshaw to take us across an eight-lane road. P.S. 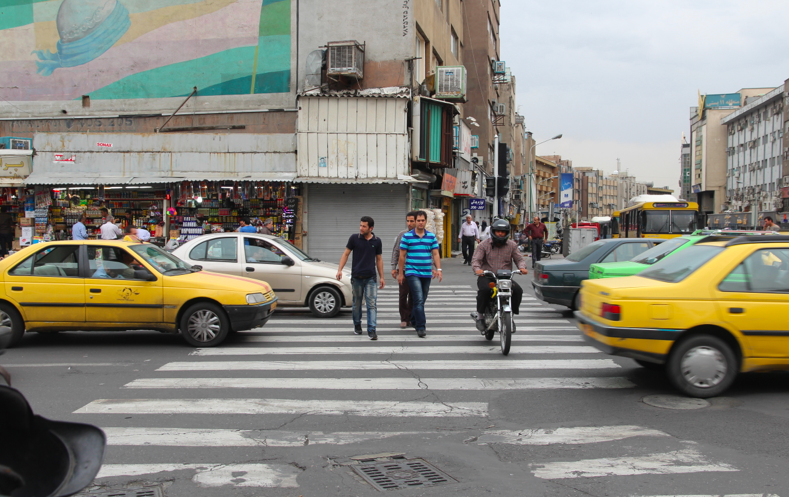 By the way, the crossing shown in these photos (in Iran) was NOT done against a red light. The green pedestrian light was on for all three pics. Oh cripes, I bet you’re right. Silly me! It’s like target practice. This changes my whole outlook on zebra crossings. I reckon it’s like cold water-you’ve just got to jump straight in! Once you get the hang of it, it’s a breeze. It’s all in the eye contact and not hesitating. It scares the riders/drivers if you hesitate, then everyone is in trouble. Yep, a steady pace and a dagger-like stare sure help. bit like Ballarat. No worries! 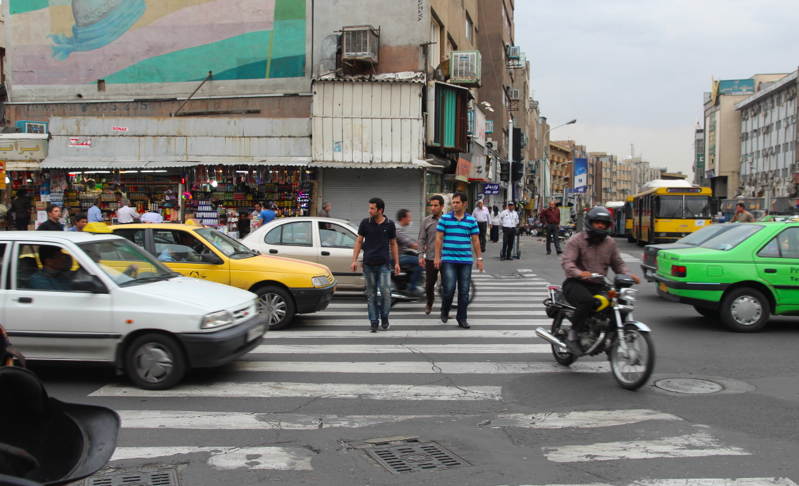 Yes, Adina, you need a head that swivels in all directions to cross the street in Iran. Every Country has different rules! In Switzerland cars has to stop when somebody is standing at the zebra crossing even if there is no traffic and enough gaps to cross the road without stopping the cars. Usually if we in other Countries don’t feel safe we follow other pedestrians. Many countries have rules that no one follows. Almost everywhere, I’m reluctant to step into traffic without waiting for cars to stop. Oh wow, Terri, I hadn’t realised that The Sudan swapped sides of the road. Burma did the same, and it made for a traffic nightmare. All these roads built for right-hand drive, and then to switch to the other side. So dangerous. Mucho years ago (1955) my grandmother (I guess around 70+, wow my age now) went to a big department store for a sale/bargain… and saved money from the original price. However, she got a “Jay Walking” ticket (I guess around $15 US Dollars) which negated the bargain… trying to cross the street when there was a green light for cars to move forward. This law is still on the books, but rarely does a police officer give tickets for this… and there are many “Jay Walkers” in New York City. Aside- LeggyPeggy should tell the story of her crossing the street in Hanoi, Vietnam ?…. scary! Oh Sy, your comment made me laugh out loud. Your poor gran getting a jaywalking ticket. She must have been furious. As for my harrowing experience in Hanoi—here’s a link. I am the family joke at home as to what a whimp I am crossing roads so I agree travelling in China, Iran and Georgia the main danger was crossing the road. I would wait for a group of locals, plant myself in the middle and hope for the best. 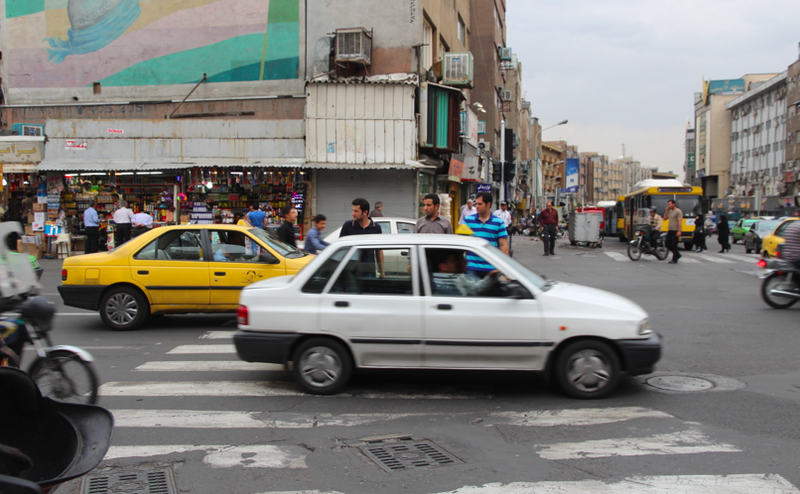 I got pulled back from starting to cross by a much more elderly woman in Isfahan. I’m not a complete wimp when it comes to crossing roads, but I’m darned careful. Especially because the pedestrian crossings are a suggestion only.